Last month I was invited by local wine educator Helen Savage for a tasting of wines from Producteurs Plaimont, a co-operative in the South West of France. Presenting the wines was Xavier Didelon, an Alsace native who has worked for Plaimont for the last 2 years. 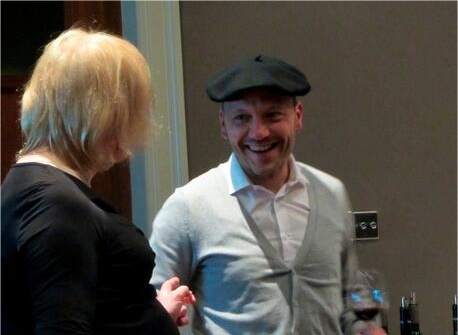 He’d just flown in from ProWein in Dusseldorf and the North East welcomed him with plenty of rain! Helen had gathered a busy room of local wine enthusiasts, both amateur and professional; including local retailers Michael Jobling and Carruthers & Kent, plus Suzanne Lock from AdVintage. Along with 10 wines from “one of the most dynamic cooperative group of producers in the world” there was a delicious supper of Charcuterie and cheese laid on in the impressive surroundings of the Northern Counties Club, my first time at this venue. Producteurs Plaimont lies in Gascony, in the foothills of the Pyrenees between between Toulouse & Bordeaux and covering the Côtes de Gascogne, Saint Mont, Madiran and Pacherenc du Vic-Bilh wine regions. It was founded in 1979 as a small co-operative of 3 villages; Plaisance, Aignan & Saint Mont and has since been joined by producers in Crouseilles and Condom. It now has over 1000 growers, 200 employees and covers 5300ha of vineyard, bottling 80-90% of its own wine. Plaimont is atypical for most co-operatives in that it has a dynamic, international view and is at the forefront of research into winemaking and viticulture; focussing on the local grape varieties Gros Manseng, Petit Corbou, Colombard and Tannat. While its main market is France (~45%) it exports to China (for 15 years!) Netherlands, the U.K. and Germany, with a view to expand to other countries such as Japan & Russia. They effectively “force” their growers to visit clients in other markets and this exposure obviously works – see this South Korean TV presentation on Plaimont on YouTube, demonstrating a fondness for the Gascon Beret! The appellation of Saint Mont in particular has a lot of sandy soils and includes some pre-Phylloxera, ungrafted vines from the 1880s. Plaimont make approx. 100 bottles a year from such Heritage vines; unknown grapes with the vineyard named for the late owner Rene Pebernard (who’s great grandmother told him the vineyard was “old” in her day). Although such vines are historically significant the wines are less so, with Xavier searching for the appropriate translation to describe the taste before coming up with ….”disgusting!”. Still, rare varieties such as Arrufiac and Pinenc (Fer Servadou) are included in several of the Plaimont wines for character, while the proximity of the Pyrenees means that in summer the day-night temperatures can vary by 20 degrees, which helps flavour complexity in the grapes. Before concentrating on the wines Xavier finished talking about the remaining history and current activities of Plaimont in the local community, including the organisation of a regular summer jazz festival. 11% abv. 80% Colombard, 20% Ugni Blanc. Tank fermentation, reductive winemaking and no malo-lactic fermentation. 2013 was a hard year for the region, losing 30-40% production due to adverse weather. The wine itself had a fresh, fruity nose with some grassy/herby tones and a touch of melon. There was sharp acidity at the front but with a rich mid-palate, and a mineral/metallic aspect. “Dry with a background of sweetness” – very pleasant for an entry-level wine. Les Vignes Retrouvees 2012 Saint Mont. 13.5% abv. 60% Gros Manseng, 35% Petit Courbu, 5% Arrufiac. Night harvest, 6-8 hours skin contact for the Gros Manseng. No malolactic. There was discussion on the peppery edge of the wine, a characteristic shared with Shiraz and Grüner Veltliner. The wine itself is named “the rediscovered vines” in tribute to the ancient local grapes varieties such as Arrufiac, which has a long history being blended with Petit Courbu in Gascon wines. It was Plaimont’s founder, Andrė Dubosc, that helped resurrect interest in this and other local grapes. The wine was aromatic with a creamy component, very light on the palate to begin with developing a herbal/nettle bitterness and a spicy warmth. Peppery and dry, a good, characterful wine. Le Faîte 2011 Saint Mont Blanc. 13.5% abv. 70% Gros Manseng, 20% Petit Manseng, 10% Petit Courbu. Several hours skin contact, the Petit Manseng (which brings a sweetness to the wine) is barrel fermented with lees stirring. The remaining blend gets 6 months lees ageing with no malolactic. This last white is at the top-end for Plaimont, a special blending from the best areas of the cooperative. 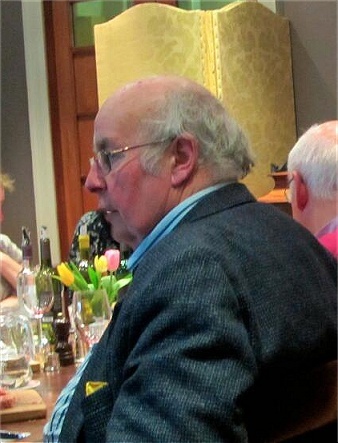 They invite wine experts to become “Godfathers” to the wine, including in recent years Gerrard Basset, Tim Atkin and Anthony Rose. It had a sweet nose suggesting a glycerol richness. It was dry on the palate, oak was evident with a herbal bitterness and a long finish. A good, complex wine. Rosé d’Enfer 2013 Saint Mont. 12% abv. 55% Tannat, 35% Pinenc, 10% Cabernet Sauvignon. The winemaking technique for this rosé was expanded on, somewhere in between the direct pressing typical for Provence and the Saignée (bleeding) method more common in Bordeaux. The night-harvested grapes were maceration and given 1 hour skin contact before pressing, giving a darker colour that direct pressing but less extraction than typical using the Saignée technique. It had a salmon pink colour with a subtle nose of red berry fruit, not too bold. There was good texture to the mouthfeel but a bitterness on the palate and it comes across as a little too dry. Not my favourite. Béret Noir 2011 Saint Mont. 13.5% abv. 70% Tannat, 20% Pinenc, 10% Cabernet Sauvignon. Sandy & silty clay soils. 24 hours cold soak. Fermentation and 1 year ageing in tank. No oak. Named with a nod to the black beret of Gascony this wine led to a discussion on Tannat needing to attain full ripeness, otherwise it will be very bitter and tannic. Plaimont help with this by plenty of leaf pruning and increasing the height of the canopy (which is a balancing act not to shade neighbouring rows) to allow the sun through to ripen the grapes. The wine had a lovely nose of rich, syrupy fruit with some caramel. Young tannins kick in from the mid-palate, firm but in balance with the creamy fruit and some light garrigue undertones. Although a little short on the finish it was a good wine. 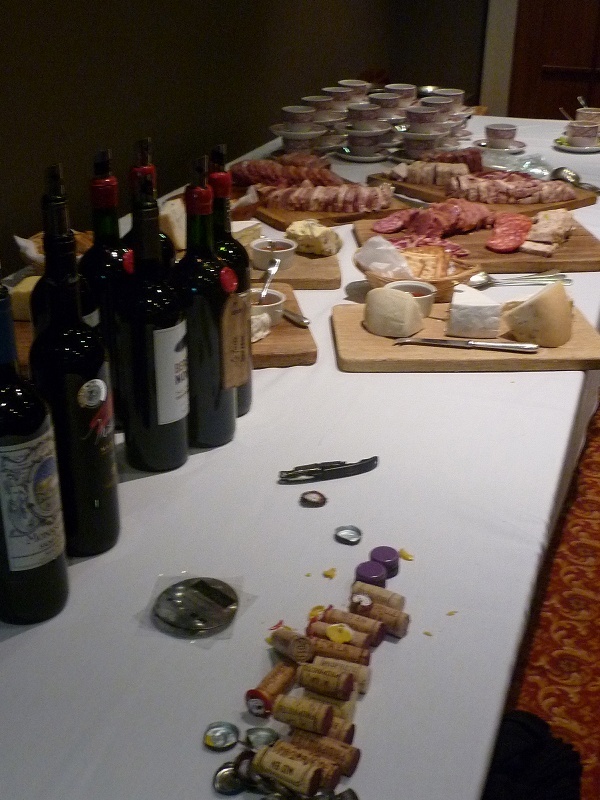 It was about now that the accompanying food was placed on the tables, delicious meats and cheeses to go with the wines. Unfortunately no-one knew what the different types were, but there was a certain blue cheese with a strong, salty flavour that went so well with all the reds on the evening – Helen confirmed that salt, not fat, is what makes food work so well with tannic wines. Le Faîte 2010 Saint Mont Rouge. 14.5% abv. 70% Tannat, 20% Pinenc, 10% Cabernet Sauvignon. From deep yellow, sandy soil. 20-25 day fermentation & extraction with 10-12 month ageing on 1/3 new barrels. Same blend as the previous one but a step-up in quality. As with the white Le Faîte the grapes are from selected plots of vines. This had a graphite (pencil) nose with an understated strength. Powerful on the palate, dry throughout with dark, sweet fruit and graphite again. Finishes a little quick compared to the structure and complexity, but delicious nonetheless. Monastère de Saint Mont 2012 Saint Mont. 14% abv. 70% Tannat, 20% Pinenc, 10% Cabernet Sauvignon. Mixed soil (Clay, Sand & clay-limestone) for complexity. 48hr cold-soak, 25 days extraction (different techniques). 12 months in 1/3 new oak. The monastery vineyard, on the slopes of the hillside village of Saint Mont, dates back to the Benedictine monks in the 11th Century. It is currently owned by French media celebrity Françoise Laborde who apparently lives up to the aloof, nouveau-riche celebrity stereotype (based on a first-hand story from Helen). The third of this blend composition – an excellent comparison of the 3 grapes at work – the wine had a (nice) touch of farmyard on the nose with cool menthol and graphite. An elegant, integrated wine; rich, very balanced with great depth and layers of complexity yet remaining smooth. A lovely wine. It was at this point that I realised my camera wasn’t taking pictures, even though I thought I’d snapped a good dozen or so – I later realised a memory card is an essential component, so it was of little use sitting next to my computer back home! (Thanks to Kelvyn Guest for agreeing to me using some of his pictures). 14% abv. 80% Tannat, 20% Cabernet Sauvignon. Clay with a layer of pebbles and gravel. 48hr cold soak and <20 day extraction (punching down only). Unoaked. Madiran wine is expected to show more complexity than Saint Mont, although historically they were over-extracted with no charm; “like leather when young and like mushrooms when old”. Xavier said there is a generational change in Madiran where wines are being made for drinking young, fitting in with market preferences. 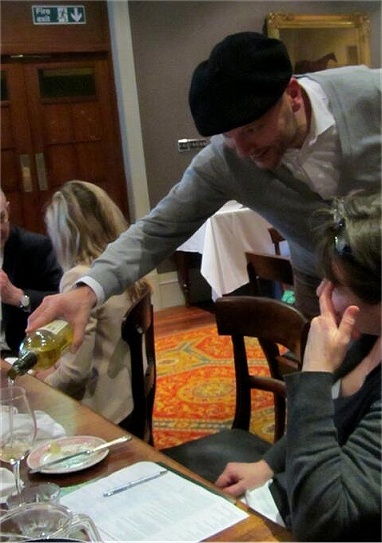 This wine led to a discussion on the political correctness of saying whether a wine is masculine or feminine, and also into the use of micro-oxygenation to “polymerise the tannin” and emphasize the fruit”. It had a perfumed, feminine (!) nose with a graphite edge to the dark fruit. Cool on the palate, the fruit is young and the tannins skirt around the sides – quite fine and firm, not aggressive. Decent balance with more of that graphite component, another good wine, and definitely a different style to the few Madiran’s I’ve tried previously. 14.5% abv. 80% Tannat, 20% Cabernet Sauvignon. Clay soil. 20-30 day maceration with punching down. Micro-oxygenation in tank, malo-lactic fermentation in barrel. 8-12 months in oak. Xavier confirmed the final red as one of their top-end offerings and that it was ”still a baby”. It had a savoury nose with a little touch of farmyard and was a precise, well-made wine; peppery at the front, firm tannins on the mid-palate, dry with a warming finish. This is a serious wine, it just needs time to settle down. We finished the evening with a sweet wine from Pacherenc du Vic-Bilh, the white only appellation which is co-localized with Madiran. The name is believed to be derived from the Gascon (Bearnaise) “paisheradas”, stakes to support the growing vines (from the old country, “Vic-Bilh”). There were lots of Pacherenc novices in the room yet to try these late harvest Moelleux wines (I had previously only tried the dry Pacherenc du Vic-Bilh Sec from Château Montus). Saint Albert 2012 Pacherenc du Vic-Bilh. 12.5% abv. 50% Petit Manseng, 30% Gros Manseng, 10% Petit Courbu, 10% Arrufiac. Named for the feast of St. Albert on November 15th, around when the grapes are picked. Aged 8-10 months in 50% new oak with lees stirring. Apparently “Manseng is a bugger to grow” and is naturally high in acidity, giving great balance to sweet wines made from it. This had a refreshingly light nose with a touch of spritz on first sip. Gently sweet with a touch of pineapple, the fresh acidity makes this a delicious cheese wine, working well with all the different types and styles on the table – a fitting end to the evening. Helen and Xavier had put together an excellent tasting and it was great to chat to Suzanne, Claire and Mo and see Michael Jobling looking so well. Xavier was the perfect ambassador for Plaimont; relaxed, informative, friendly and helpful as we tasted our way through the wines and learned about the south west of France. I will definitely look out for more wines from this area in the future. This entry was posted in Local Tastings, N.E. 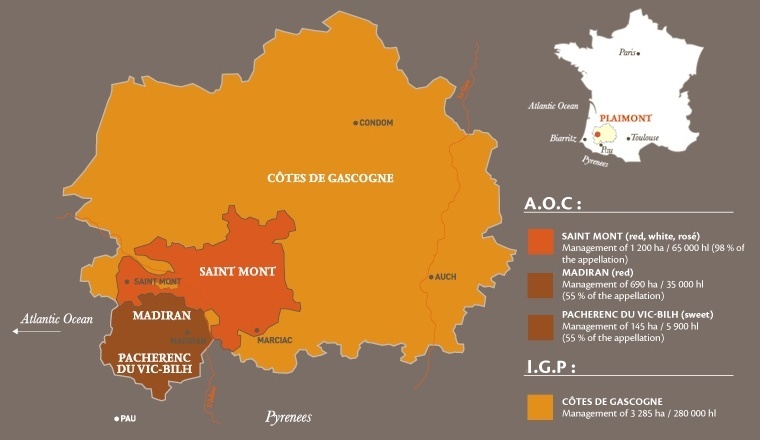 Retailers, Wine Producers, Wine Regions and tagged Gascony, Helen Savage, Madiran, Pacherenc du Vic-Bilh, Plaimont, Saint Mont, South West France. Bookmark the permalink.